Tooth resorption is a pathological dental condition in which the cells of the body attack and actually ‘eat away’ or dissolve tooth structure. It is a painless process. There are two types of resorption which can affect both the crown and root of the tooth. Note: the root is that portion of the tooth that is below the gums and anchors firmly in the jaw bone. The crown is the actual tooth that can be seen when one opens their mouth. This occurs within the central part of the root canal…where the dentin resides (inside of the pulpal walls). It can be seen on an x ray as a circular/dark hollowed out area. Please see image number one. The first clinical signs are usually a pinkish area within the crown of the tooth. The pink colour is due to blood vessels (hyperplastic pulpal nerve tissue) that fill in the resorbed area. Please see image number two. This is similar to internal resorption however it begins on the external surface of the root and works its way inwards. Please see image number three. What is the cause of resorption? Resorption is due to an inflammatory process which occurs as a result of some sort of trauma, infection or hyperplasia. Hyperplasia is an increase in the amount of organic tissue that results from cell proliferation. The resorption or eating away of tooth structure is caused by a group of cells known as Osteoclasts. If you’d like to get technical, it is the result of differentiation of Macrophages into Odontoclasts. 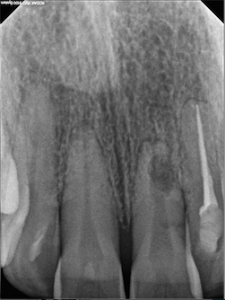 1) Ectopic teeth erupting in the path of the root. This can be a wisdom tooth that is impacted and grows into the tooth in front of it. 4) Aggressive tumors and cysts. 5) Extreme orthodontic forces and teeth that are ‘moved’ too rapidly in the mouth. Question: What is an Inflammatory Process? Answer: As a result of a harmful injury on the body, a complex biological response occurs in which pathogens, damaged cells or irritants act on the said damaged area. 1) Remove the initial cause of the cellular injury. 2) Clean out debris, damaged and necrotic tissue as a result of the initial trauma and inflammation. 3) Begin repair of the injured tissues. In a nutshell, resorption whether internal or external, is destructive in nature. 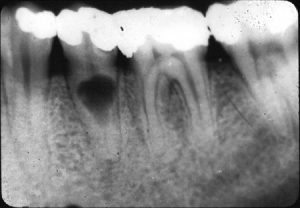 Regular dental visits with routine x rays may be a way of detecting resorption before it becomes so destructive that the tooth cannot be saved. 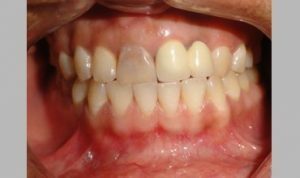 In the next series of blogs, we will look at both internal and external resorption in more detail.